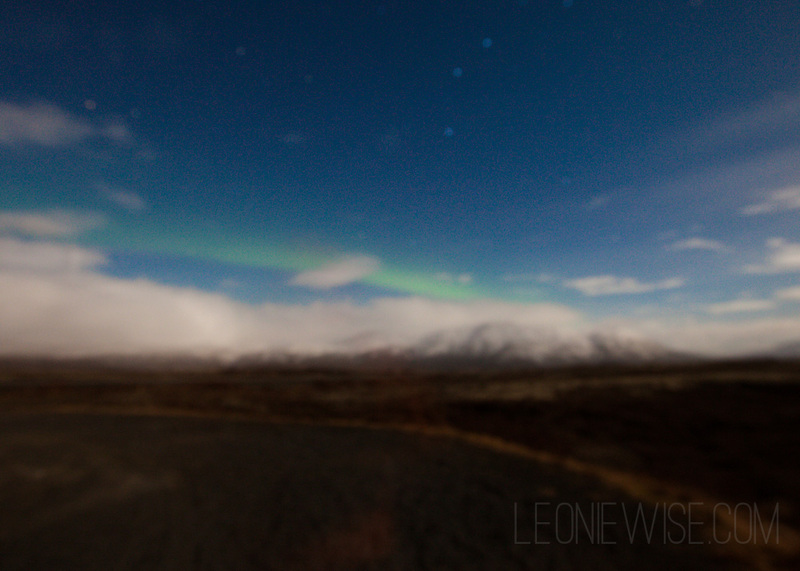 we are in iceland over new year’s for a second time since living in the northern hemisphere. i fell in love with this country the first time we were here and, since we didn’t see any northern lights last time, we decided to come back and try again. preparing for our tour, we dress warmly against the cold. later, out in the freezing cold wind, we discover it’s not warm enough. we join a bus already crammed with people and i grumble about having to sit in the very back. i don’t like not being able to see out the windows. the air-conditioning stops working and it becomes unbearably hot and stuffy; i can’t take enough layers off to cool down. we drive into the darkness following a convoy of other light chasers. it’s about an hour’s drive to the national park from reykjavik and our guide keeps up a running commentary. as well as a few icelandic facts, he’s constantly reminding us that the lights can’t be switched on and off and that driving around doesn’t help. he warns us that we will head to the spot where a sighting is most likely and we will stay there. he warns us that we could be waiting a while. and that we may not even see anything, though the conditions are the most favourable that they have been for quite some time. we arrive and the bus parks side on to the wind. it’s freezing and the wind is strong enough to almost knock us over. we stand in the lee side of the bus, darting to the other side from time-to-time, looking for signs of light. we stand around for an hour. i set my tripod up and take a couple of long exposures. i’m not expecting any of them to turn out well, as the wind is shaking the tripod so much that it almost tips over. my eyes are straining to get a glimpse of the aurora. my hands are freezing and my toes are getting cold too. i add another jacket to my layer of clothing, refusing to give up and go back in the bus. eventually there are only about six of us left standing out side. everyone else has retreated to the warmth and they’re dozing or talking quietly. an exclamation from the guide about seeing something on his camera screen has us all scrambling for cameras and everyone on the bus piles off again. but not for long. 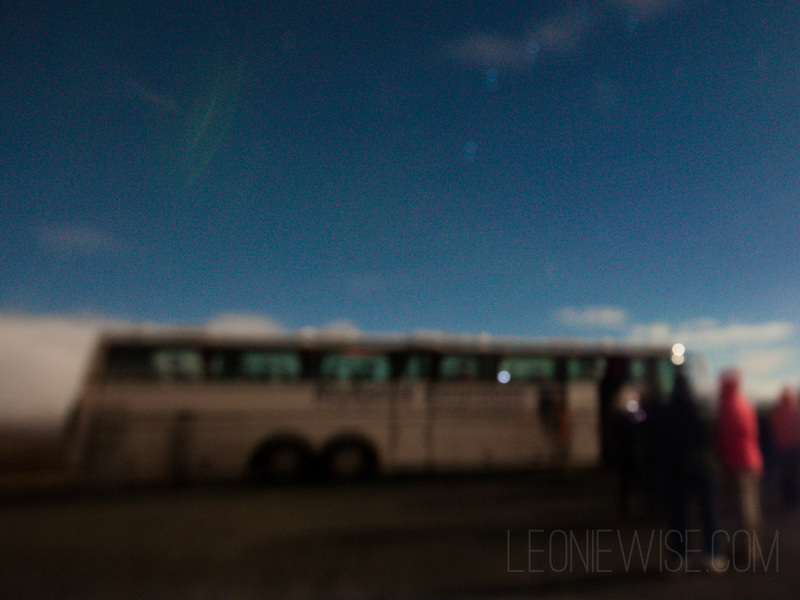 i make another couple of long exposures and, after another long wait, we climb back on the bus and head back to the city. it is only when i get home and look at the photographs i made on a bigger screen that i see the green. invisible to our eyes out in the dark, not so invisible to my camera. grainy, but tangible proof of their presence. i was hoping for a dramatic display like this, and i’d be lying if i said i wasn’t disappointed. but for now, kinda magical that you captured a glimpse through your photographic eye. I would have been disappointed too, but its amazing how they did show up on your camera. definitely don’t give up. It’s my goal to see them one day too. I so hope you get to see them in full force someday but what a cool glimpse of them! I’ve seen them a few times here in Canada…pretty epic to see! I ran the Reykjavik half marathon last year, and I know exactly what you mean about falling in love with Iceland. It’s such a captivating place – it prodded at my soul and made me want more. I’ll certainly go back, maybe to catch a glimpse of the Northern Lights (hopefully). Glad you (kinda) saw them!